Volcano (translated by Richard A. Schuchert) introduces us to Junpei Suda, an old man about to retire from his position as section chief at a Kyushu weather observatory. The town he lives in is overlooked by the (fictional) volcano Akadake, and ever since arriving in the town fifteen years earlier, Suda has been obsessed by the mountain which, literally and metaphorically, casts a shadow over his life. Asked by a local councillor and businessman to give assurances that the volcano is unlikely to erupt again (and thus endanger a hotel project he is planning), Suda is able to trot out the results of his (pseudo-scientific) research. Comparing himself to Akadake, he believes that they are both moving closer and closer towards death. However, what if the research he has poured his heart into turns out to be wrong? Volcano isn’t overly long (only about 180 pages), but it packs a lot of ideas and imagery into its story. Akadake looms over the town and the novel, but we don’t really need to know whether it is going to erupt or not. It represents everything that affects our lives, the ideas we are unable to escape from, despite living the fantasy of a ‘free’ existence. Suda, typically, attempts to ignore the signs he sees on his trips to the mountain, just as he deliberately ignores the growing coldness of his wife and children. Durand though attempts to fight against his ‘volcano’ with his petty attempts at corruption. You have to read The Samurai, Tony! 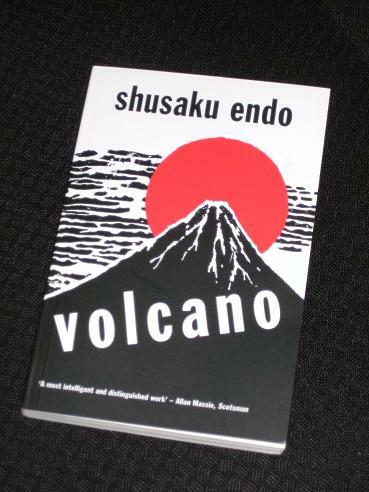 It's still my no.1 novel by Endo (well, I've only read 2.5 so far). I'm currently in the middle of Silence which I'm finding is one that you shouldn't race through. Sakura – Hmm, I wonder if I could swing a review copy of that (I'm on a book-buying hiatus as of today!). Oh, this does sound good. I already have a copy of When I Whistle, so that will probably be my next Endo, but perhaps this one will be my next after that. (Although I have been considering The Samurai, which I believe Sakura recommended to me a while ago. And since you saw my post a couple of days ago, you won't be surprised that I'm going to suggest Kiku's Prayer. Nothing is likely to match up to 'Silence', but this one (very like 'Kiku's Prayer' from the sound of it) is an interesting modern progression from the historical novel. Love this writer, but have yet to read this one, my favourite at the moments is Kiku's Prayer, which recently toppled the short story collection Stained Glass Elegies, which I'd suggest to Tom, as a good place to start. Gary – I've read some good reviews for both of those (and I'm sure you'd enjoy this one too! ).